Last week Engadget reported that samsung is developing a new virtual reality headset, which will be similar to Oculus VR's headset - and will also sport an AMOLED display. Today Engadget reports that Samsung's headset is actually developed in collaboration with Oculus VR. In this collaboration Oculus provides the software while Samsung provides the hardware. As part of the collaboration, Samsung gives Oculus early-access to its next-gen high-resolution (larger than Full-HD) OLED displays. Samsung's upcoming headset will not have its own screen - rather you will have to plug-in your Samsung phone (current prototypes use a GS4, but the final product will require a GS5 or maybe even one of its successors). 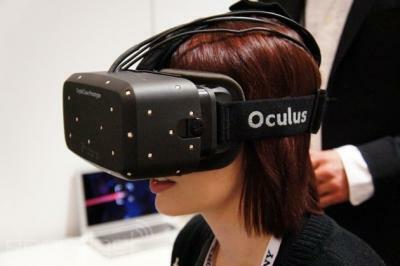 In January Oculus VR unveiled their latest HMD prototype, which adopted a low-persistence OLED display. Oculus said that they chose the OLED because they really want a low persistence display. They say that "it’s incredible the difference low persistence makes... It’s mind-blowing". Back then we speculated that the OLED is made by SDC (there's no other choice, really) - but it was puzzling because Oculus said the display is faster than any OLED in the market. Now we understand this because Oculus is using a next-gen OLED not yet available in any commercial device. I'm very excited by the many things that Samsung can offer VR OEMs and put in their own devices. This includes the incredible Super AMOLED display, but it may also include things like low latency wireless video links, sensors, video upsamplers, SoCs, flexible displays, optics distortion correction hardware (rather than software), binaural audio acceleration hardware, etc, etc. I think that VR headsets will be as similar and interchangeable as TVs are today, and this is a market that Samsung can support while others worry about the content. This would be very much like their other electronic devices.